Rosi Amador during a recording session in her Cambridge studio. If you’re hearing voices these days, chances are there’s no reason to worry about your mental health. There’s the omnipresent Siri, Amazon’s Echo, GPS, podcasts, and the usual cacophony generated by announcements in airports, video game characters, Internet ads, automated messages, and much more. Voice production is so integrated into our technology that it’s easy to forget that usually someone, somewhere, has recorded the files we hear. While talent agencies still control much of the commercial marketing work, voice-over entrepreneurs are now producing their own content, thanks to professional-quality home studios. 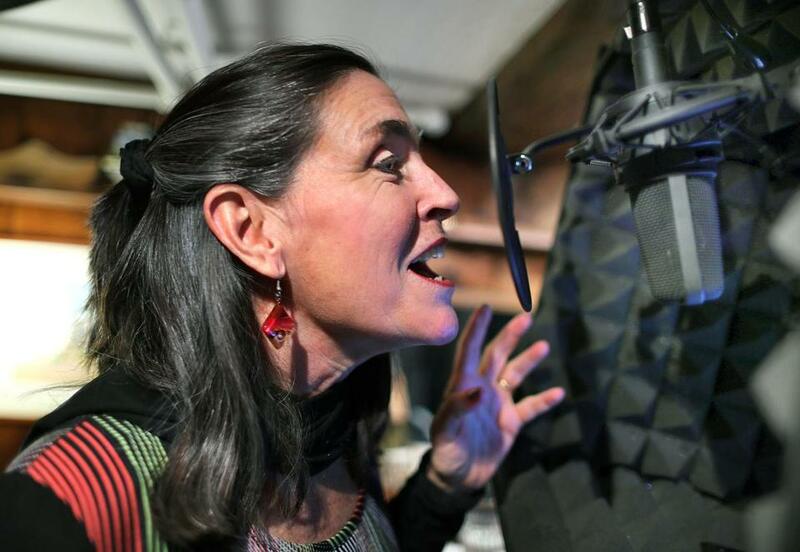 In Cambridge, Rosi Amador, Latin singer turned voice-over artist, operates Amador Bilingual Voiceovers. She installed a state-of-the-art recording studio in the basement of her family’s 1850s home. Amador is known for her friendly, expressive, and sparkling intonation — you can hear her after-hours on the Children’s Hospital of Philadelphia’s telephone system (“For dermatology, press 1; for endocrinology, press 2 . . . ”), as well as Expedia travel videos, Barefoot Books storytime CDs, radio promos for “Downton Abbey,” and an audio tour app for the Smithsonian. Amador and her husband, Brian, also a bilingual voice actor and guitarist, still occasionally tour as the Sol y Canto band, but mostly they are in front of microphones in the studio, trying to maximize the effectiveness of their clients’ messages. Originally from Puerto Rico, Amador can easily switch from accent-free English to Spanish. One of her many projects involved recording voice instruction for Spanish curriculum tapes aimed at young learners. “To this day, there are people who approach me and say, ‘Are you the Rosi that I learned Spanish with on tapes?’ ” Amador says. She spoke with the Globe about using her voice as a tool for growing a business. “I stumbled upon the world of voice-overs as a professional singer in my Latin band, Sol y Canto. One of our fans, an educational media producer, hired me as a bilingual narrator and singer. But the project that steered me toward a full-time voice-over career happened when I was hospitalized just before giving birth to my twins. The hospital’s marketing department approached me about doing a radio and print media campaign to promote the hospital’s NICU [Neonatal Intensive Care Unit]. I loved the experience of working in the studio, taking direction through my headphones. I began investigating what it would take to transition from music to voice-overs. “Being a singer has served me well in my career as a voice actor, in which breath control is vital. For a 15- or 30-second TV ad with way too many descriptors, for example, I take a deep breath and power through long sentences while still sounding natural. Otherwise, it sounds like a used car ad. “The key to making a living as a voice-over talent is perfecting your craft, learning to be your own engineer, negotiating rates and invoicing, and marketing yourself continuously. Our studio has acoustic insulation, a soundproof window and curtain, and state-of-the-art recording equipment. It’s across from our home office and near a walk-in closet that we call ‘Studio B’ — very handy when both my husband and I have to record at the same time. As soon as he built it, we stopped quibbling over who got access to the main studio. “Our daughter Alisa is also a voice-over talent who has done audio books and documentaries, eLearning, and commercials. “In the end, all voice acting is storytelling. No two voices are alike. They differ in pitch, tone, volume, tempo, accent, and even the way we color our natural speech, or add emotion. My goal is to continue to develop my own authentic sound and not to impersonate anyone else. I deeply admire Meryl Streep, Morgan Freeman, and Patrick Stewart’s expressive voices, and I particularly enjoy Salma Hayek and Anthony Mendez’s Hispanic-accented English narration.